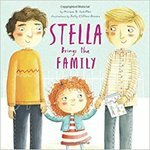 Stella brings her two fathers to school to celebrate Mother's Day. Schiffer, Miriam B., "Stella Brings the Family" (2015). DIVerse Families. 631.